40th Wedding Anniversary II, 2002 - 2004. Anthony Green (born September 30, 1939) is an English contemporary realist painter and printmaker best known for his paintings of his own middle-class domestic life. His works sometimes use compound perspectives and polygonal forms—particularly with large, irregularly shaped canvasses. As well as producing oil paintings, he also produces a number of works designed from the start as limited edition prints, which are typically giclée works. Anthony Green was born September 30, 1939 at Luton, Bedfordshire, and educated at Highgate School, London (where he was taught by Kyffin Williams) and the Slade School of Art. In 1960 he moved to Paris and Chateauroux on a scholarship from the Government of France. He returned to England in 1961 and married Mary Cozens-Walker, with whom he has had two daughters. His first one-man exhibition was held at the Rowan Gallery in 1962. He taught at the Slade from 1964 until 1967 when he received a Harkness Fellowship and spent two years living in Leonia, New Jersey and Altadena, California. Green was elected an Associate Member of the Royal Academy on April 23, 1971, was elected a full Member on March 1, 1977, and won the Royal Academy Summer Exhibit of the Year in 1977. He has had almost 100 one-man shows worldwide. A retrospective of his work was held at the Royal Academy in 1978, and in Japan in 1987-88. In 1991 he was elected a Fellow of University College London and in 1996 was shortlisted for the Jerwood Painting Prize. 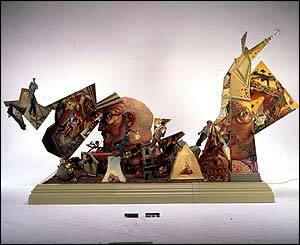 Green’s work Resurrection, a pictorial sculpture for the Millennium, toured UK cathedrals in 2000. In 2000, Green was appointed as a Trustee of the Royal Academy, and he was elected to the New English Art Club in 2002. In 2003 he was a featured artist at the Royal Academy Summer Exhibition. He lives and works in Cambridgeshire. Anthony Green page at the Royal Academy website. Anthony Green 1960–86. Tokyo: The Japan Association of Art Museums / Yomiuri Shinbun, 1987. (No ISBN.) Catalogue of exhibitions held in Niigata, Tokyo, Osaka and Iwaki, 31 October 1987 – 15 May 1988; text in Japanese and English.